This then is our quick guide to how with a lot of planning, a taste for adventure and a little luck, India’s Golden Triangle can be an amazing adventure for a family with young children. We decided early on that we were going to put our plans in the hands of the professionals for some of the trip. We contacted numerous tour operators based in New Delhi and finally settled on Divino Indian Memoirs. Contacting their office, they were very quick to respond and their emails were always full of information. We were also attracted by the tone of their initial emails which stated very clearly that as the client, we were in the driving seat when it came to deciding where we wanted to go and what we wanted to do. That isn’t to say that they didn’t have a clear itinerary on offer but what they did offer was packed full of activities, far more than our little ones could have handled and they were more than happy to let us decide what to keep and what to remove. Choosing a good tour operator for our first 4 days was the single best decision we made for this trip. It allowed us to see the highlights without dragging the kids around an unfamiliar metro system or on long, crowded train journeys. We opted for a 4 day ‘Golden Triangle Tour’ which included a spacious Toyota Innova, driver and several guides at each location. It also included hotels and breakfasts at each location. The operator offered 3 different standards of accommodation (3 star, 4 star and 5 star) and even though we treated ourselves to 5 star the whole tour only came to $778 for the 4 of us. Guides in India are generally very accommodating and will respond to requests and suggestions should you have any special requirements (there are exceptions, see ‘Warnings’ later in this post). Due to immigration delays at the airport we were late into arrivals and after being met by our driver we were taken to Qutub Minar to meet our first guide (see our in depth review of Qutub Minar with Kids). After visiting we were asked if there was anything special we would like to see. 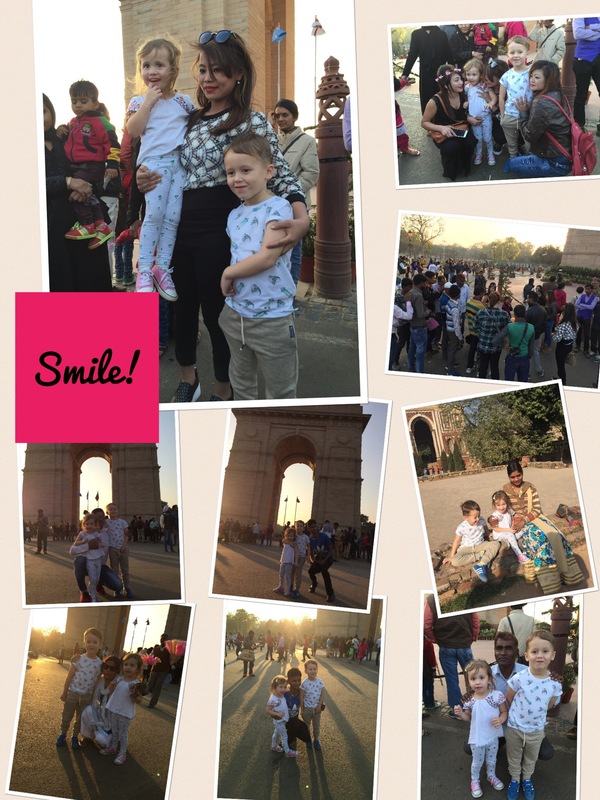 We requested a quick stop for lunch and afterwards went to see India Gate at sunset before being dropped at our hotel for the night. The driver had advised that we make an early start for Jaipur on day two and so we got up around 6:30 for a quick breakfast in the hotel before embarking on the 5 hour drive to Jaipur. Driving between the cities had been our biggest concern for the children when booking and we set out loaded with iPads, books, games and the like to keep the children entertained. Once we were out of Delhi however these became unnecessary as the children contented themselves with spotting animals. First cows, then camels and finally monkeys and elephants closer to Jaipur. 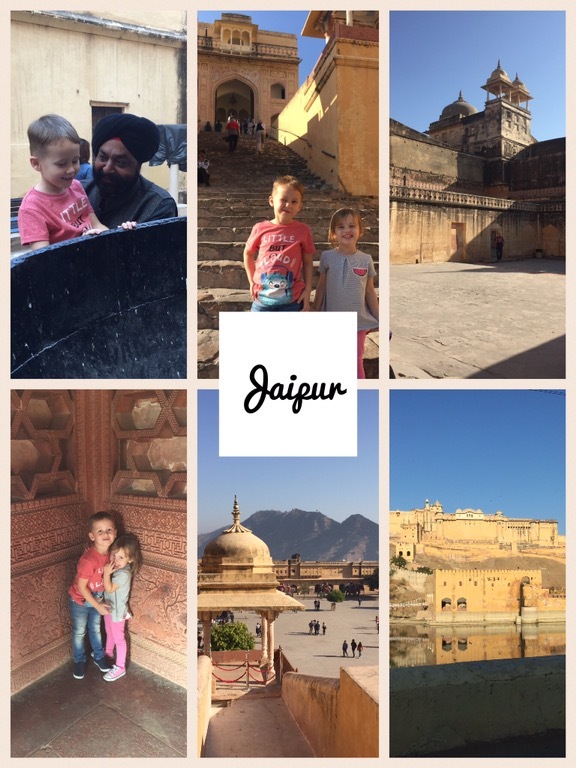 Arriving in Jaipur we met our guide and visited the city palace and then the Jantar Manar complex before returning to the hotel for the evening. At both of these locations our guide was fantastic for helping with buying tickets, suggesting amounts for tips and leading us straight to the best views and highlights. From memory, entrance to the city palace was 500 rupees per adult and Jantar Manar was 200 rupees per adult. Children were free. Accommodation was at Hilton Jaipur. After another early start we went to meet our guide for a tour of the Amer Fort. This included an elephant ride up to the fort itself. The children loved this, especially being so close to the elephants, although as the man in charge piled all four of us onto the back of a single elephant I couldn’t help feel both sorry for the elephant and worried about our safety as we all clung to the elephant and struggled not to fall off. On the way back we stopped to take pictures of the Jal Mahal and Hawa Mahal before setting off on the 5 hour drive to Agra. Prior to reaching our hotel, we picked up another guide and headed to Akhbar III palace at Fatehpur Sikri. We arrived late in Agra and checked into our hotel in thick fog. Amer Fort tickets cost 500 rupees per adult, children are free. Elephant ride was included in our tour price. Fatephur Sikri tickets cost 500 rupees per adult, children are free. There is also an additional fee for the bus which takes you from the ticket office to the entrance. This was less than 100 rupees. Accommodation was at Jaypee Palace, Agra. Without a doubt the highlight of our tour, Day Four was Taj Mahal day. I have detailed the whole experience in more detail in a seperate post. After the Taj Mahal our driver suggested a lunch stop before heading back to New Delhi where the tour ended and we check into our own hotel. Entrance to the Taj Mahal was 1000 rupees per adult. Children were free but did have to pay 40 rupees for shoe covers in order to enter the Taj Mahal itself. One huge recommendation I would make about any family trip around the Golden Triangle is to factor in some rest days at the end of the adventure. We booked 4 days at The Claridges after our tour was over to allow us to relax, reflect on the adventure and just have some chilled-out family time together. 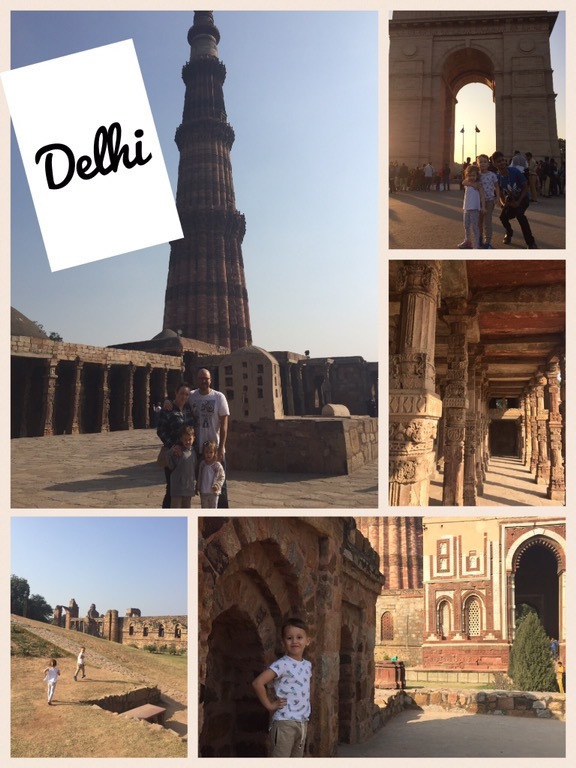 It also allowed us to experience some of Delhi which we missed on our first day owing to delays and tired children. Keep it as simple as possible. The Golden Triangle, especially in four days, requires a lot of travelling. Our kids travelled well and with the sights all around on the roads between the cities, there’s a lot to look out for. But once we arrived at our destination we tried to limit ourselves to one or two places to prevent the children getting bored. You will also find that a lot of places on this route are great for children to stretch their legs and have a run around and in most places nobody will mind. At Qutub Minar in particular, our children had a great time running up and down grassy hills and exploring the ruins and the only attention they received was from people wanting to take their photographs. Hawkers and people selling things for children are also invariably present at most significant monuments. India Gate in particular was full of people charging a few rupees for a ride on a small remote control car. The photostop area by Jawal Mahal was also full of people trying to sell toys to our kids. Most things in India are not free and you should be prepared for tour guides to become touts once the tour is finished. Even the guides provided by our agency frequently had somebody to recommend or a place they wanted to take us that was not on the itinerary. Our guide in Jaipur told us that as an extra he was going to take us to see how gems were cut and polished and within 15 minutes were we being shepherded into a jewellery shop where we were given the hard sell and then treated to the owner becoming impatient when we said we did not want to buy anything. The same guide took us to his friends textile shop the next day where we were similarly pressed to buy shirts, bags and bedding. 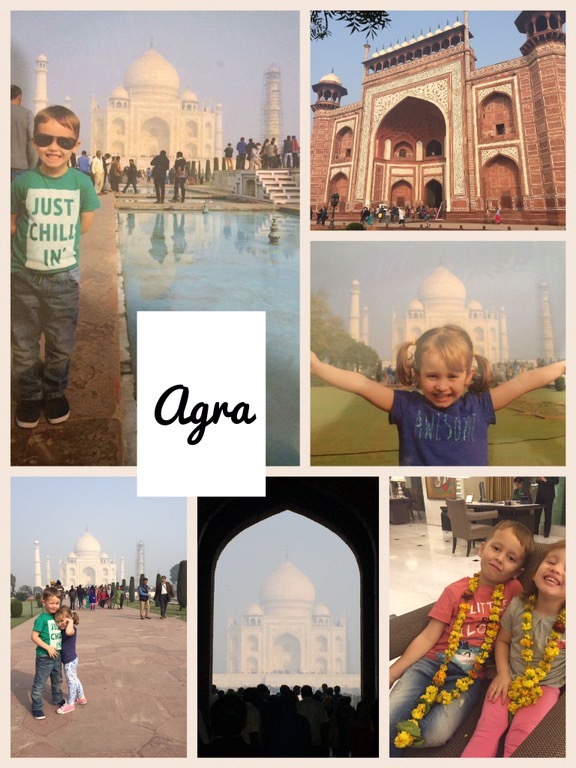 And in Agra, our Taj Mahal tour was finished with a trip to the guides friends marble shop where our children were given chocolate to keep them occupied whilst we were shown a selection of tables and cheese boards and provided with international shipping options. The easiest thing to do in this situation is to inform the merchant that you are not interested,but even when you do this, they can become pushy or act offended by the fact that you have ‘wasted their time’. 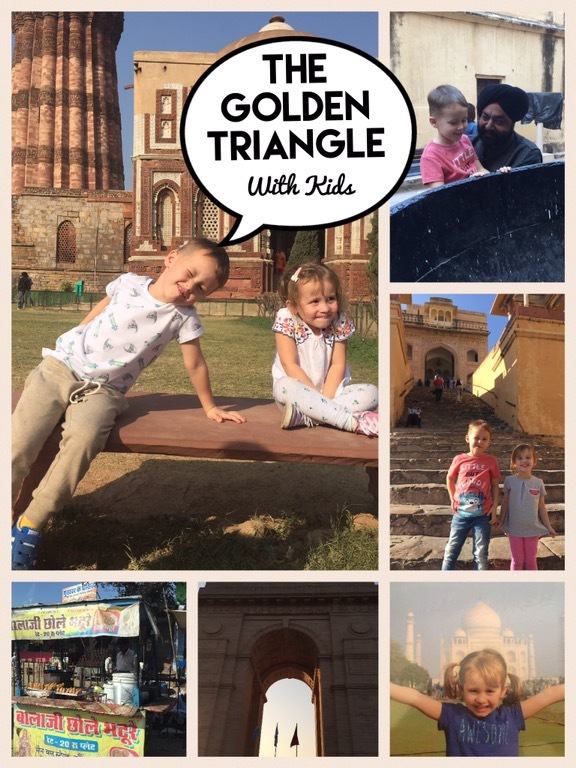 We found the Golden Triangle not only possible, but enjoyable with our two young ones. They coped with the driving and loved the sight seeing. Having a driver and guide really helped and the itinerary and accommodation providing by our operator made everything simple. People in India love children. We were swamped wherever we went by people wanting to take pictures with our two. Did being driven from one site to another by a driver take anything away from our travel experience? I don’t know. But I do know that we had a fantastic adventure despite travelling with a 5 year old and a 3 year old and every one of us had a great time. Get organised and India is your oyster; even as a young family. Great review! Looking to take my 8 year old next year. Thanks for reading. It was an amazing experience and something both of our children still regularly talk about. Happy travels!